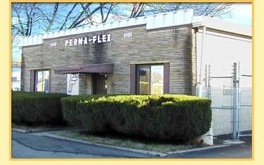 The Perma-Flex Mold Company, Inc. Thank you for your interest in The Perma-Flex Mold Company, Inc. Since 1944, Perma-Flex Mold has supplied the mold making and casting industries and we would like to take this opportunity to introduce you to Perma-Flex and hope that you will consider Perma-Flex for your mold making material, casting material and release material supplier. Perma-Flex is a formulator and a distributor of rubber mold materials for mold development. We are also a third-generation, family run business. Third generation is important because it means that you will get the expertise and experience of a long-running operation. Family-run translates to ethics, integrity, flexibility and impeccable customer service. It also means that if you have a special need or concern, a problem, or even a suggestion, all you do is pick up the phone can call, ask for Bob, he is the President. We have rubber mold systems, such as all of the current synthetic rubber systems to include polyurethanes, polysulfides and RTV Silicones. As no one product is best, its nice to know alternatives are available. Many factors must be evaluated when selecting a mold material plus keeping up to date on new materials and techniques. Rather than having a limited selection as with other suppliers, we offer and can discuss with you the advantages and limitations of all system and then very specific materials so that you obtain the maximum advantage from the mold. Most often, when limits are not known and observed, problems follow and we are good at solving problems. Our purpose today and in the future is to offer assistance to you in this selection process, use and application. Perma-Flex began in 1948 as a mold company but quickly recognized better materials were required. We would like to add you to our list of happy customers, but for us to continue, you must be satisfied. Although we have systems available, if they do not provide to you a benefit or improve current operations, we will be frank in our recommendations to you. Perhaps in the future, we may earn your business or in an application where a special material is required. The selection of the rubber mold material must be matched to the application and if we have a poor match, the mold will provide marginal service. Better alternatives may be and are often available. Therefore, the mold application must be matched from start to end less your valuable time is lost. This is one service we provide to our customers, our experience and expertise in materials and methods. Being realistic, when a mold fails or does not perform to its maximum, the cost to you is labor. Give us a try, and experience why we have earned a reputation for high quality, dependable service and prompt delivery. Where we may be of assistance, please feel free to contact us.